Mt. Prospect, Ill., March 27, 2018 – Power, connectivity and a best-in-class user interface combine to make the Bosch GWS18V-45PSC 18V EC Brushless Connected 4-1/2 in. Angle Grinder a must-have product for tough grinding applications. The grinder features a Bosch EC brushless motor that offers maximum efficiency and low maintenance, plus connectivity that delivers next-generation control including mobile-device-based maintenance review and performance notifications. The Bosch GWS18V-45PSC grinder delivers outstanding performance, including metal cutting. This Bosch-exclusive design provides greater runtime and more power than similar cordless grinders with brushed motors. That means professionals can rely on a cordless grinder that delivers 9,000 no-load rpm, but doesn't forego power in favor of maneuverability. The grinder’s HMI interface provides a large screen that changes color based on grinder operating status: green for operational; yellow identifies an issue with the grinder like kickback; red means the grinder is offline; and blue means the grinder is connected to a mobile device. The corresponding free Bosch Toolbox app can be found at the Apple App Store® or the Google Play® Store. The grinder’s interface works with the Bosch GCY30-4 Bluetooth® connectivity module, which provides next-generation user control from a mobile device. Users can customize the grinder, change the speed of the soft-start function, set the brightness of the LED, plus receive battery charge and safety information. 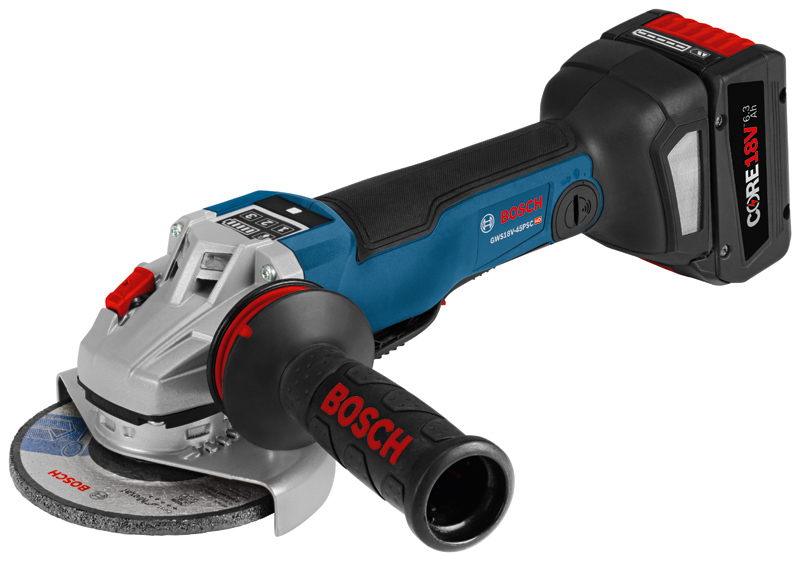 To learn more about the Bosch GWS18V-45PSC angle grinder or to find a local dealer, visit www.boschtools.com or call 877-BOSCH-99. Check out www.bethepro.com for additional tips and videos. Apple App Store® is a registered trademark of Apple Inc.
Google Play™ Store is a trademark of Google Inc.